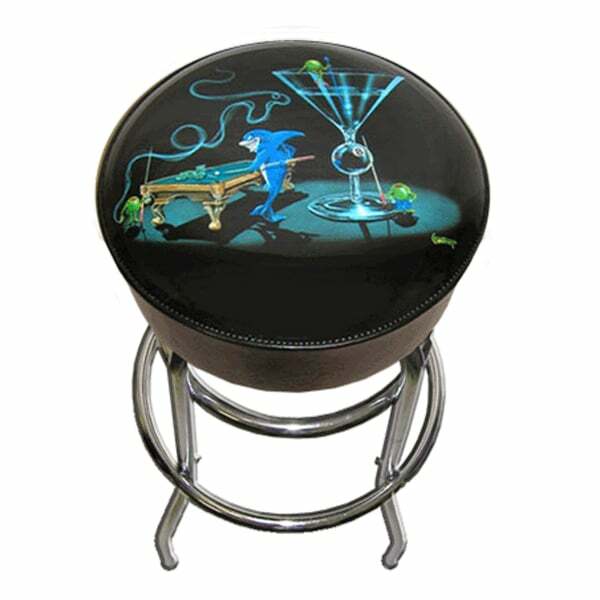 This Bar Stool offers a scene that exemplifies Michael Godard's style, with familiar themes of smiling pool sharks, billiard playing olives, and a giant martini glass. Michael Godard artwork features whimsical characters in fun settings the Las Vegas native enjoys, such as casinos, pool halls and the beach! A great addition to any game room bar, this bar stool matches perfectly with Godard's 30" Pool Shark Bar Stool and 30" Pool Shark III Bar Stool. Match a set of all three of these bars stools together and watch as your guests smile and laugh when they visit your home's bar.